Local elections were held in Iceland today. I don’t have the habit of covering local elections much for many countries, but given the high-profile race in Reykjavík (much noted on the interwebs, of course) and the economic mess the country is in, these elections were an interesting way to gauge the evolution of public opinion since the 2009 elections. The Best Party is favoured to form the next municipal government, but it needs the external support of two other members, which could likely come from the SDA or the Left-Greens. In Iceland’s second largest city, Kópavogur, located in the suburbs of Reykjavík, a twenty-year old Independence-Progressive coalition lost its majority and the local ‘Next Best Party’ won 13.8% of the vote, electing one councillor. In the northern city of Akureyri, an independent list won an overall majority sending Independence down 18% and the Alliance down 14% overall, giving the independent list 45% of the vote and 6 seats. In Hafnarfjörður, a small industrial suburb of Reykjavík, the Alliance lost its overall majority, winning 5 seats, down two, and 41% of the vote, narrowly ahead of the Independence, whose result was up 9% and won two additional seats to reach 5 seats, while the Left-Greens took the eleventh seat. The Independence Party maintained its majorities in Reykjanesbær, Garðabær, and Mosfellsbær; suburbs of Reykjavík, which I assume are wealthy. I can’t find results nationwide, but while the Independence Party seems to have picked up some ground lost in its 2009 landslide defeat, the major results have been poor for incumbents in general and excellent for insurgent outfits such as the Best Party, with their message well adapted to the general anti-politician or anti-incumbent climate in the midst of the economic crisis. State elections were held in the Austrian state of Burgenland, which is Austria’s least populous state. This thin and formerly Hungarian territory has long been a stronghold of the left, for reasons likely related to its poverty and isolation, but I’m not entirely certain. Yet, with relatively few immigrants, parties such as the FPÖ have never been as successful in this region as they were in other regions, though the FPÖ managed to win nearly 15% of the votes in the 1996 election but saw its fortunes fall in 2001 and again in 2005. These elections were not really much of a test for the federal government, given the left’s stranglehold on the state and the continued popularity of the Landeshauptmann, Hans Niessl. Indeed, the left supported a plebiscite earlier this year on the construction of an asylum centre for immigrants in the state, which was rejected with more than 95% against. The local SPÖ’s such stances have helped it keep the upper hand and has prevented the FPÖ from gaining votes as a result of the unpopularity of asylum seekers and immigrants, and the creation of a ‘Liste Burgenland’ by ex-FPÖ members haven’t helped them much. These results exclude postal votes which could boost both turnout to 75% or so and boost the Greens over the 4% threshold and win one seat, likely wrestling it from the LBL. The SPÖ easily maintains control of the state, though it now holds exactly 50% of the seats, though there is no doubt, obviously, that they will remain in control of the state. The Greenies, who had a poor campaign, did rather poorly. A long-awaited and much anticipated general election was held in the Czech Republic on May 28 and 29. All 200 seats in the Chamber of Deputies, which are elected in 14 electoral constituencies through d’Hondt 5%-threshold PR, were up for election, almost four years after the last election in 2006. This election, originally rumoured to be in 2009, was much delayed until it was finally set to May 2010. In May 2009, the government of Mirek Topolánek collapsed after a non-confidence motion was passed, after months of stalemate in a parliament where the government held 100 seats and the opposition held 100 seats – making the government dependent on both shaky coalition allies and one or two opposition rebels. Since then, a caretaker government – which ended up lasting over a year – was formed led by Jan Fischer, a little-known economist and former head of the Czech Statistical Office. Since around the mid-1990s, two parties have dominated Czech politics. On the right, the Civic Democratic Party (ODS) was founded in 1991 by neoliberal members of the heterogenous anti-communist Civic Forum, which had won a crushing victory in the 1990 elections. The ODS’ most famous member is Václav Klaus, Prime Minister between 1992 and 1997, and incumbent President. He is known for his eurosceptic views and his denial of man-made global warming. The ODS does stick out from other European conservative parties for its euroscepticism and it’s more pro-American positions – it is similar in those regards to the British Tories, with whom they are allied in Brussels. On the left is the old Czech Social Democratic Party (ČSSD), originally founded in Austro-Hungarian Bohemia in 1878 and later a major Czech party during the First Czech Republic. The ČSSD was, unlike most East European parties, re-created in 1989 and thus was not a continuation of the communist party. The ČSSD did move slightly to the right, like almost all its European counterparts, on economic issues, and between 1998 and 2002, Social Democratic Prime Minister Miloš Zeman governed with the ODS’ support and undertook some major economic reforms. The Czech Republic sticks out in another way from its neighbors by the continued strong showing of a totally unreformed and ‘undesired’ communist party, a continuation of the KSČ. The Communist Party of Bohemia and Moravia (KSČM), which peaked at 18.5% of the vote in the 2002 elections, is largely unreformed and remains outside of all coalition governments, and has also been often on the verge of banning due to its more radical communist positions. On the right, the Christian democratic KDU–ČSL, also a continuation of a pre-war party, has usually been the third or fourth party, relying on remnants of support for the old ČSL in poorer rural areas in Moravia. There have been two, now three, ephemeral outbursts of other parties, the first was the far-right in 1996 led by the Republicans of Miroslav Sládek (8%), which exploited latent anti-German and anti-Rom sentiments in the industrial areas of Bohemia (which used to be in the Sudetenland). The second came from the more pro-European social liberal centre, namely the Freedom Union, which won 8.6% in 1998 before receding in 2002 to 9 seats through a deal with the KDU–ČSL and completely collapsing in around 2004, in favour of the centre-right Green Party which won 6% in 2006 but has since fallen from peaks of up to 10%. Perhaps the result of the economic crisis, but also the result of old corruption scandals in both major parties and the poor leadership of both Topolánek and Social Democratic leader Jiří Paroubek, there has been a boom in the fortunes of new, small populistic and ‘alternative’ parties. 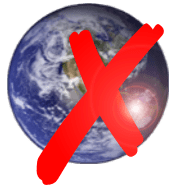 The largest one is TOP 09, founded by pro-European dissidents of the ODS and the KDU–ČSL’s right-wing, which is led by former Foreign Minister Karel Schwarzenberg. It has gained a lot from Topolánek’s gaffes and incompetence, the most recent incident of which (insulting comments towards Catholics, Jews and homosexuals) forced him to resign in mid-campaign from the ODS’ leadership in favour of Petr Nečas. The second major party is the Public Affairs (VV) outfit, a right-populist party led by Radek John, a former popular investigative journalist, whose support came from John’s popularity as well as VV’s ‘alternative’ and “we’re not crooks” message. A smaller party, the SPOZ, founded by former ČSSD Prime Minister Miloš Zeman (an enemy of Paroubek), has also enjoyed some support. The result are an umitigated disaster for three parties: the ČSSD (which polls its worst result since 1996), the ODS (by far its worst result), and the worst result for the KDU–ČSL since the ČSL’s first electoral participation in 1920. All three parties have one thing in common: they’re divided, they’re unpopular, they’re associated with corruption or ‘old politics’ and the first two are the major parties which seem to be so hated this election. The Greens paid dearly their division since 2009, as well as their support of the Topolánek cabinet, and bears the brunt of the ODS’ unpopularity. The KSČM, which, still set in the Stalinist mindset, remains unable to become a durable alternative, and especially not in this election, where those who really desire an alternative are 2006 ODS voters. Radek John’s VV has won an excellent result, and he bears the weight of most of the protest or alternative voting in this election, while TOP 09 attracted many voters disenchanted with the ODS. The good result by Miloš Zeman’s party and the eurosceptic party led by MEP Jana Bobošíková has also attracted significant support, though not enough to enter Parliament. What is most showing of the two major parties’ rout is their combined vote: 42.3% against 67.7% in 2006 – all full 25 points lower than four years ago! The massive fragmentation of parties after this election makes forming a stable coalition, which is more than a necessity during an economic crisis, much harder. The KSČM will extremely likely remain sidelined. It remains to be seen whether the ODS will ally with its ideological counterparts, TOP 09 and VV, or if one or both of these insurgent parties will ally with the ČSSD. It also remains to be seen what will happen to these parties, who campaigned largely on being the alternative to the ODS and ČSSD, after they enter a coalition as they’re likely to do. A grand coalition between ODS and ČSSD would be great way for both parties to continue on the road to the trash can, a road which they’ve already taken together since 2006. Jiří Paroubek, unexpectedly and surprisingly, was smart enough to read the writing on the wall and took heed of the ČSSD’s awful result and resigned, and commented that a right-leaning coalition was a near certainty. A coalition between ODS, TOP 09 and VV holds 118 seats out of 200, while the right in 2006 (composed of the ODS, KDU-ČSL and Greens) held 100. The electoral office’s page here offers an easy overview of regional results. The ODS keeps the upper hand around Prague and in central Bohemia, a traditional stronghold of the big agrarian business and agriculture, and formerly a stronghold for the Republican Party of Agrarian and Smallholding Peoples during the First Republic. In Prague, a stronghold of the ODS, the ODS plummeted a full 23.5%, leaving first place to TOP 09. The more affluent and liberal voters of Prague likely preferred the more pro-European TOP 09 to the ODS. Prague is by far TOP 09’s best region with 27.3%, and it generally did well in the same areas where the ODS did well – those more well-off Bohemian area. It didn’t break through in the KDU-ČSL’s Moravian bases, specifically the regions of Jihomoravský and Vysočina, where the KDU-ČSL still managed around 8 and 7% respectively. The ČSSD, on the above map, is clearly on top in Moravia, the poorest region of the two (central Bohemia is the historical centre of the gentry and rural aristocracy) and where old industry has led to high unemployment, and won 29% in the old coal basin of Czech Silesia. The KSČM continues its traditional dominance in both Czech Silesia but also the Bohemian industrial belt in Ústecký. Most of the population in this former industrial basin of the old German Sudetenland was extensively re-settled in 1945 and 1946, notably with a lot of Slovaks or Moravians, and integration has often been hard, sparking resentment and protest which was also expressed with votes for the ephemeral far-right in 1996. I know it’s more than tempting to twist this as a by-election and early test for the very mediatized Tory-LibDem coalition government, but it isn’t a by-election, and an election held so soon after the regular election is still, usually, in a government’s honeymoon period and at a time when the recently thrown-out government is divided, absent and embroiled in a leadership contest, reducing their media visibility as a viable alternative for those partisans opposed to the government. It isn’t different here, and it would extremely stupid to try to pick out stuff from these results. If the LibDems are to suffer loses from their association with the Tories, it isn’t in seats like this, but rather in Labour-LDem marginals or seats where the LibDem electorate is young, socially liberal and by tradition and ideology quite anti-Tory. The LibDem voters here are certainly not of that type. The bottom line is that this is not the type nor place to test LibDem support post-coalition, though the decent Liberal Party (which are nowadays to the left of the LibDems) showing could be a result of that (and the UKIP showing could be either sympathy votes, anti-coalition Tories or people voting UKIP because it won’t impact the final result much). Two elections in the Caribbean will be covered in this post, both of them legislative elections. Slightly misleading numbers as the PRSC was in fact allied with the PLD in all but one province, La Altagracia (where it won its sole Senate seat). Without alliances, the JCE reports that the PLD alone won 41.6% and the PRSC won 6.2% overall. All other parties are minor and irrelevant. Trinidad and Tobago, a major island in the south Caribbean, held a general election on May 24 for all 41 seats in the House of Representatives, whose members are elected through classic FPTP, a remnant of British rule, along with the country’s Westminster system, although it is a republic. The father of independence, Eric Williams and his People’s National Movement (PNM), dominated politics between 1956 and 1981. The PNM, of which current Prime Minister Patrick Manning is a member, has traditionally found most support with black Afro-Trinidadians, and the PNM has been a usually conservative and economically right-wing party. Unemployment and labour conflicts during Williams’ tenure has helped the rise of parties on the left, mostly supported by Indo-Trinidadians. Blacks and Indians make up around 40-45% each of the country’s population. Still in the region, voters in Suriname on May 25 elected an opposition alliance including former dictator Dési Bouterse (a wanted drug dealer), defeating the incumbent New Front led by soon-to-be ex-President Ronald Venetiaan. Dési Bouterse ruled the country unofficially for most of the 80s as military dictator of an officially socialist republic, and cracked down in 1982 on internal opponents, killing a number of them in a case which remains open to this day. He was also sentenced to 11 years in jail in the Netherlands for drug trafficking and the Netherlands has an arrest warrant for him, which prevents his exit from the country, although he cannot be prosecuted as a former head of state. Dési Bouterse’s Mega Combinatie won 23 seats against 14 for the New Front, while other parties won the remaining 15 seats out of the 52 at stake. Dési Bouterse is already a candidate for the indirect presidential ballot in July, where a two-thirds majority is required. Venetiaan is retiring. A special election was held in Hawaii’s 1st congressional district on May 22, 2010 following the February 28 retirement of incumbent Representative Neil Abercrombie in order to focus on his run for Governor of Hawaii in November. Hawaii’1st district covers part of the city and county of Honolulu on Oahu island. The district, which has an Asian majority (54%), is a relatively affluent district including Honolulu, the military base at Pearl Harbor and tourist spots such as Waikiki. The seat has long been Democratic, electing only one Republican since Hawaii got two districts in 1971, though the presence of the military base and wealthier areas make it on balance the most Republican of Hawaii’s two districts. Obama won 70% of the vote in 2008 against 28% for McCain, while Kerry had won 52% to Bush’s 47%. Hawaiian voters, especially Asian voters, are especially known to be pro-incumbent. The Cook PVI for the district is D+11. Republicans can cheer as they break a straight Democratic streak in House special elections since 2008, but it doesn’t change that Djou is extremely likely to end up serving only a few months. It’s clear that he won due to the division of the Democratic vote, something which is extremely unlikely to happen again in November given that there’ll actually be a primary in September where the Democrats will likely choose between Case and Hanabusa again. The special election is really only a Pyrrhic artificial victory for the Republicans, and while it may be encouraging for them, it really doesn’t mean anything (except for the symbolism of holding, albeit temporarily, the district where Obama grew up). The situation overall remains the same as it always was, this doesn’t change anything. A special election, or a by-election if you will, was held in Pennsylvania’s 12th congressional district on May 18 along with the primary elections across the state of Pennsylvania. The 12th is located in southwestern Pennsylvania, in the core of the Pennsylvanian Rust Belt. The current 12th district was formed in 2002 by the then-Republican state legislature as a gerrymandered district aimed to pack Democratic votes and provide the Republicans with the opportunity to win the 18th district, which covers wealthier Pittsburgh suburbs. The 12th covers old steelworks, coal mines and largely unionized working-class areas and has been long been a Democratic stronghold. However, voters in the 12th, like in much of Appalachia or so-called ‘Westsylvania’ are conservative on social issues such as abortion, guns or gay rights and, according to some, are former rednecks. In fact, the 12th was the only district to vote for Kerry in 2004 but McCain in 2008, reflecting Obama’s poor showing in much of ‘Westsylvania’. The 12th has been held since 1976 by the colourful and controversial John Murtha, who died in February. Murtha, who opposed free trade and the Iraq War, got into trouble for corruption and comments made in 2008 saying that some of his constituents wouldn’t vote for Obama because they were racist and further said that the whole region used to be redneck. He was re-elected in 2008 with 57.8% of the vote against 42.1% for his Republican opponent. The 12th, which narrowly chose McCain in 2008, was a key district for the Republicans to pick-up if they were going to make strong gains in November, enough to flip the House back to the Republicans. This was the perfect example of the ‘must-win’ district for the GOP. Their candidate was Tim Burns, who attempted to make the race a referendum on Obama-Pelosi (both of whom are very unpopular in the district), and advocated repeal of the healthcare law. The Democratic candidate was Mark Critz, a close protege of Murtha and a typical populist Democrat. He criticized the healthcare bill, but didn’t advocate its repeal, and distanced himself from Obama and Pelosi. The last PPP poll of the district (PPP was one of the only non-partisan pollsters to poll the race, though I suppose some will say PPP is Democratic) showed Burns up 48-47. While the contested Democratic primary likely boosted turnout in a district where Democrats hold a massive registration advantage, it remains a bad result for the Republicans and adds to an seven-win streak for Democrats in House special elections since 2008. This was a district Republicans needed to take to prove that they can really win in November. While they’re likely to take back at least a good dozen seats in November, these results show that they’ll need to be quite a bit higher if they’re to win back the House. The result is disappoiting, of course, for Republicans, but they could note that a) Critz distanced himself from Obama and became a Blue Dog-local candidate in a place where politics remain rather insular and b) Critz was helped by a contested Senate primary on the Democratic side which drove turnout up. Hope, for the Republicans, shouldn’t be lost. Mauritius held a general election for its 69-seat National Assembly on May 5. The UK election on May 6 and other issues made sure that I’d forget this election, but late coverage is better than nothing. Mauritius is a very interesting country, and considered one of Africa’s success stories due to its strong democratic tradition and an economy – which, somewhat uniquely for an island country, is not based on one crop. Mauritius gained independence from the United Kingdom in 1968 and became a republic in 1992, but the island, which was French between 1715 and 1810, maintains a strong French linguistic tradition, the result of an 1810 deal which allowed settlers to keep the French language and criminal law. However, a majority of Mauritians are of Indian origin, the result of massive immigration to the island under British rule to work in sugar cane plantations. Only a minority are Creole, Franco-Mauritian or Sino-Mauritian. The result of this ethnic makeup has been a strong penchant towards communalism, exemplified by the racial divisions of parties but also businesses, employment and so forth. Despite this, ethnic relations have always been peaceful, thereby helping the emergence of Mauritius as a developed, diversified modern economy and major economic and political hub of the southern Indian Ocean – something also helped by stable politics and a democratic tradition inherited from the British. Stable politics doesn’t mean stable coalitions, however. Elections in Mauritius are often won by coalitions, and these coalitions are dominated by the island’s three main parties. Two of them fight for working-class Indian votes, and one is more multi-communal though it does tend to draw its support from non-Indians. The Mauritian Labour Party (PTr) was founded in 1936 on the model of its British counterpart, and sought independence for the island and various labour rights for Indians then employed in sugar plantations. It is dominated by the Ramgoolam family, of which the nation’s first Prime Minister, Sir Seewoosagur Ramgoolam and current Prime Minister Navin Ramgoolam are the most famous standard-bearers. The PTr’s ally in 2010, but rival in 2005, is the Militant Socialist Movement (MSM), founded in 1983. The MSM, of which incumbent President Sir Aneerood Jugnauth, the ‘father of the Republic’, is the historical leader, is also a rural-based Indian-dominated party. In opposition to the PTr-MSM alliance this year was the 2005 ally of the MSM, the Mauritian Militant Movement (MMM), founded in 1969 which is a more urban and multi-communal party. Its leader since 1976 has been Paul Bérenger, a Franco-Mauritian, and Bérenger was Prime Minister between 2003 and 2005 at the head of a MMM-MSM coalition, which fell apart this year. This year, the PTr was allied with the MMM and the smaller Mauritian Social Democrat Party (PMSD), the party of the Duval clan (a Creole family), which opposed independence in 1967 (the 1967 elections were won by Sir Seewoosagur Ramgoolam) and traditionally represents the wealthiest of voters, most of them being old Franco-Mauritian plantation owners. The PMSD’s current leader is Xavier-Luc Duval, Vice Prime Minister. This alliance, branded Alliance de l’avenir, was opposed by the MMM-led Alliance du cœur, but also the Muslim (16% of the population) based Mauritian Solidarity Front (FSM), the former Hizbullah (no relation to the Hezbollah). The island of Rodrigues, the largest and most important of the three island dependencies of the main island, has its own political parties. Rodrigues is largely Catholic, white or Creole, which explains its political differences. The National Assembly has 62 seats elected in 21 multi-member constituency, all of which have 3 seats except a four-seater (Grand River North West and Port Louis West) and a two-seat Rodrigues constituency. The island of Agalega is attached to the 3rd constituency. In addition, in a clear example of the communalist structure of politics, 8 additional seats are distributed (really, appointed by the Supreme Court) to ethnic groups and losing candidates. It is known as the ‘best loser system’. 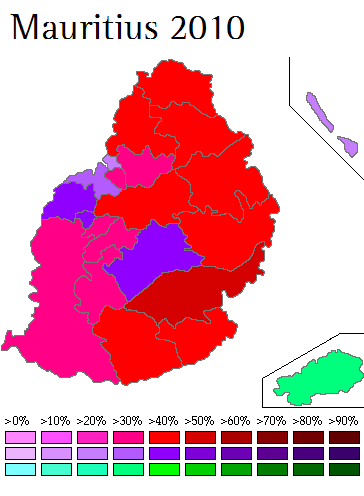 Only 7 of these 8 seats were distributed this time, apparently since neither of the two parties eligible for the eight seat – the FSM and the Rodrigues Movement had a Sino-Mauritian candidate, and the eight seat is given to a Sino-Mauritian. The map above shows the percentage vote polled by each party overall, because results are reported by candidates, each voter having three votes. The pattern is quite clear and fits in with the history of each party. The PTr-MSM alliance dominated in rural areas, where a lot of Indians live and historically worked in old sugar plantations, or, since more recently, in small manufacturing industries. The MMM alliance dominated in two areas; the urbanized area around the capital, Port-Louis, and around Beau Bassin. The FSM elected its sole MP in Port Louis Maritime and Port Louis East, and Muslim candidates did well in Port-Louis. The PTr-MSM accused the MMM of going after Muslim votes, which perhaps explains the MMM’s strong performance in Port-Louis. The MMM also won inland around Curepipe and Midlands, which seem to be well-off largely non-Indian areas. More coverage of primary season in the United States with the four states which voted last night: Arkansas, Kentucky, Pennsylvania and Oregon. Arkansas’ Class III Senate seat is up for election this year. Incumbent Democratic Senator Blanche Lincoln, a conservative Blue Dog, was first elected in 1998 and re-elected in 2004. She’s up for re-election this year, but her closeness to corporate America and her conservative votes make her one of the most vulnerable senators up this cycle, and on top of that she’s never been really much of a strong incumbent. She won in 1998 with 55% in 1998 and “only” 56% in 2004, despite Arkansas’ strong Democratic leanings at the state level. Her conservative votes, notably her much-noted opposition to health care (likely the result of a close relation with corporations), won her much ire from liberal Democrats and trade unions, who backed the insurgent Lt. Governor Bill Halter, who staged a late primary challenge to the weak incumbent. A third candidate, a conservative Democrat to the right of Lincoln (and very much anti-Obama), DC Morrison also ran. The Republicans have been polling ahead of Democrats in all polling, and their field was dominated early on by Representative John Boozman, a popular representative from the Ozarks region of northwestern Arkansas. He faced a challenge from 2004 nominee Jim Holt and State Senator Gilbert Baker amongst others, but he was always the likely nominee. Halter and Lincoln will face off again in a runoff to be held on June 8. Halter came very close, sometimes even ahead at some points during the night, of Senator Lincoln, showing how extremely vulnerable she is. 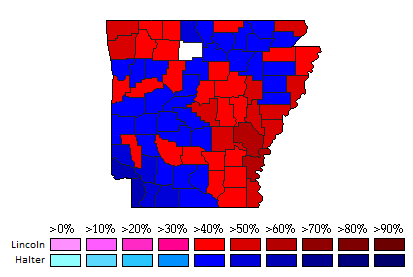 She seems to have held black voters and won in Little Rock (and the Ozarks), but Halter has seemingly dominated in large swathes of rural Arkansas, somewhat interestingly for the liberal insurgent to the conservative Blue Dog. It remains to be seen if Lincoln has an edge in the runoff, and if she can win the right-wing Morrison voters, but on the basis of last night’s results, she seems extremely vulnerable to Halter, who will have more time to polish his message, in a runoff. Yet, a runoff means that this race stretches out for a long time and will likely result in an internal division within the party, helping the Republicans. Boozman won 53% last night, meaning that there will be no runoff. Holt won a meager 17% while Gilbert Baker won 11%. Boozman must still be counted at the overwhelming favourite to win in November. Arkansas’ Democratic Governor Mike Beebe, who succeeded retiring Republican Mike Huckabee in 2006, remains extremely popular and won’t face stiff competition from Republican Jim Keet. In fact, the surprise is that the Republicans actually managed to find a candidate, given that they didn’t field one against Senator Mark Pryor in 2006, who only faced a Greenie. Kentucky’s Class III Senate seat is up for election this year. Republican incumbent Jim Bunning, first elected narrowly in 1998 and re-elected by a similarly narrow margin in 2004, is retiring after a series of controversial statements he made on various topics. In fact, he risked losing re-election if he ran. His retirement opened up the Republican field, which became a race between two candidates: Trey Grayson, Kentucky’s Secretary of State and the early-on establishment candidate and ophthalmologist Rand Paul, the son of Ron Paul, and also a low-taxes campaigner and activist. Paul quickly seize Grayson’s early lead and led by double-digit in polls prior the primary. Rand Paul campaigned against the PATRIOT Act and against taxes, making him the candidate of the Tea Partiers, but the rest of his platform was generally conservative: pro-life, anti-gay marriage and the like. Obviously, to win in a state like Kentucky, which is as far away from libertarianism as you can get, you need to have the conservative rhetoric. Paul’s success came more from his insurgent anti-Washington attitude than from any love of libertarianism in a socially conservative state. The Democrats had a contested race as well, between Lt. Governor Daniel Mongiardo and Attorney General Jack Conway. Mongiardo was the favourite in all polls, and was the most conservative candidate in the race, while Conway, the insurgent, was the liberal candidate in the race. Conway’s narrow victory was the marking result of the Kentucky primaries, especially given that Mongiardo had led in all but one poll (in December 2009). 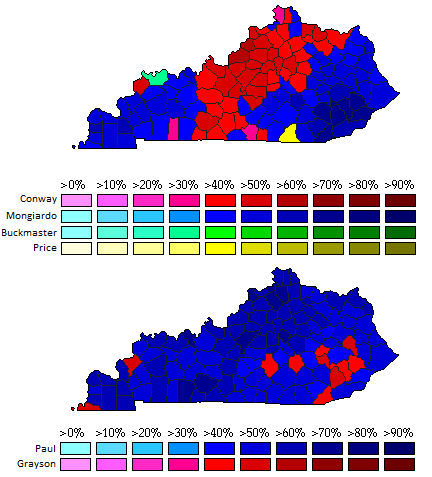 The map of the race reveals a close division between the coal mining regions of eastern Kentucky, where Mongiardo is from and where old Blue Dog-type populist politics dominate (as well as in the Purchase area of western Kentucky, the traditional Dixiecrat stronghold of the state) and Conway’s strong victories in Louisville and other more urbanized or developed areas in central Kentucky. Mongiardo has asked for a recanvass of the votes, but it’s unlikely that Conway’s victory will be fought. On the Republican side, Paul dominated all over, with the exception of a handful of counties, mostly in eastern Kentucky. Again, Paul played best in the same urbanized-developed area where Conway did best, on the Republican side, these areas include a lot of suburbs where low-tax rhetoric works wonder (just like Stutzman won Indianapolis suburbs in Indiana two weeks ago). Polls have given Paul a narrow advantage, but Conway is shown to be a stronger candidate than Mongiardo, meaning that this race is best called a tossup. Oregon’s Class III Senate seat is up for election this year. Democratic incumbent Ron Wyden is favoured to win easily, and he beat minor primary challengers on the Democratic side with over 90% of the vote. Jim Huffman, a little know uni prof of some sort, won the Republican primary with nearly 42%, while his closest opponent polled 15%. Oregon’s Senate contest is not being watched much, and only one poll – by Rasmussen – was done in the state, showing Wyden leading Huffman 49-35. For the record, Oregon votes entirely by mail or drop-off ballot in primaries. The Oregon gubernatorial contest to replace term-limited Governor Ted Kulongoski (D) might be a bit hotter than the Senate race. Former Governor John Kitzhaber (Governor between 1995 and 2003) won the Democratic primary with 66% of the vote against 29.5% for former Secretary of State Bill Bradbury. For once, the Republican establishment candidate prevailed: Chris Dudley, a former NBA player, won 39.9% against 31.9% for Allen Alley, who found most of his strength in conservative rural eastern Oregon. Kitzhaber got national attention when he literally saved somebody’s life at a debate earlier this month. A Rasmussen poll in April showed both Dudley and Kitzhaber tied at 41% each, but then, Rasmussen has weird results at times. Pennsylvania’s Class III Senate seat is up for election this year. The seat has been held by Arlen Specter since 1981, first elected as a moderate Republican and last re-elected by a wide margin in 2004. Specter, who became more and more at odds with the growingly conservative Republican Party, was never the favourite of conservatives. He narrowly survived a primary challenge by conservative Republican Congressman Pat Toomey, and was likely to face an extremely tough race against Toomey again in 2010, especially after being one of 3 Senate Republicans to vote in favour of Obama’s bailout package. Then, Specter left the party on April 28, 2009 and became a Democrat and voted for the healthcare bill. He faced opposition on the Democratic side from Congressman Joe Sestak, a former US Navy Vice Admiral and a liberal Democrat. Sestak ran to Specter’s left, and always referred to himself as Joe Sestak, the Democrat, a snide remark at Specter’s former Republican affiliation. Specter won the endorsement of Obama, Biden, Governor Ed Rendell, Harry Reid, John Kerry, the mayors of Philadelphia and Pittsburgh, the state Democratic Party and most trade unions. Sestak notably won Barney Frank, NARAL and MoveOn’s endorsement. Specter had a huge lead over Sestak in 2009, but he blew it away thanks to a poor campaign, and by election day, it was tied. On the Republican side, Pat Toomey, already running against Specter, became the favourite and faced opposition only from the fringe and perennial candidate Peg Luksik. Toomey, the former leader of the fiscally conservative Club for Growth, is a favourite of the low-taxes and anti-pork crowd. Sestak’s victory was surprisingly large, despite Specter leading early returns and tied polling prior to the primary. He won most support in rural areas, while Specter only won Philadelphia (where the Democratic machine and black voters backed him), Dauphin and Lackawanna counties (blue-collar areas where local party support and unions won it for Specter). Seemingly, wealthy suburban voters as well as rural voters in traditionally Republican inland Pennsylvania were Sestak’s strongest backers. Sestak’s victory is yet another in a series of anti-establishment victories by insurgents, and Specter is the second sitting Senator to lose renomination in 2010 after Utah Republican Senator Bob Bennett fell victim to right-wing opponents at a State Convention earlier this month. Sestak is seen by most as the strongest candidate to take on Toomey, who still maintains a narrow lead in polls – though Sestak could narrow that down and win. On the gubernatorial side, incumbent Governor Ed Rendell (D) is term-limited. The Republicans, who nominated Attorney General Tom Corbett (69-31 against State Rep Sam Rohrer) is the favourite against the Democrats. Allegheny County (Pittsburgh) Chief Executive Dan Onorato was the top contender on the Democratic field against Auditor General Jack Wagner, former Congressman Joe Hoeffel and State Senator Anthony Williams. Onorato won 45% against 24% for Wagner, 18% for Williams and 13% for Hoeffel. A map of that primary is attached to the Senatorial primary map. I don’t think it should be too hard to figure out where Williams and Hoeffel are from. In final news, in last week’s West Virginia primary, long-time Democratic Congressman Alan Mollohan, representing WV-01 since 1983, fell victim to a right-wing primary challenger (Mollohan is already a blue dog, so imagine more right-wing than him) Mike Oliverio, a State Senator. Oliverio is quite far to the right and it would be hard to distinguish him from a conservative Republican. The Philippines held a general election on May 10, 2010. The President, who is elected to a six-year term, was up for election as were 12 out of 24 Senate seats, all 286 seats in the House of Representatives and a number of major provincial and municipal governors or mayors. The President of the Philippines, who has power close to the US President, is elected for one six-year term (the constitution’s wording of one six-year term has been wishy-washy, allowing the incumbent President to serve 9 years – 2001 to 2010, since she took over from an impeached President in 2001 and was only really elected once) by popular vote, in which the candidate with most votes wins, no runoffs. Similar to Brazil’s 1945-1964 system or certain systems for US Lt. Governors, the presidential candidates have running mates of their own but the Vice President is elected a separate vote (so there is no requirement to vote for the running-mate of your presidential vote). The Senate, which has 24 members elected for six-year terms, is renewed by halves every three years. The system is rather simple: the country is a multi-member FPTP constituency and the top twelve vote-winners win. The House has 229 single-member FPTP constituencies and 57 proportional seats allocated by party-list with a minimum 2% threshold for seats. The Philippines won full independence from the United States in 1946. Between 1946 and 1969, the Philippines had a rather organized two-party system organized between the Nacionalista Party, founded in 1907 to push for the country’s independence and traditionally aligned on the right; and the Liberals, a left-wing splitoff of the Nacionalistas founded in 1945. These two parties both represented various factions of the omnipotent landowners and their political clans and machines. The election of Ferdinand Marcos, a Nacionalista, defeating incumbent Liberal President Diosdado Macapagal in 1965 completely changed the balance of power. Marcos, in power until the People’s Power Revolution of 1986, took absolute control of the country in 1972 with the declaration of martial law and forced all major parties to merge into his new outfit, the Kilusang Bagong Lipunan (KBL). Marcos, who claims credit for starting a basic agrarian reform hindered by massive central government corruption and certain reforms in the country, took control of the country at the expense of the traditional oligarchic families, alienating them and driving them into an unholy alliance with democrats and the Catholic Church, a movement which culminated in the 1986 People’s Power Revolution (in which the army’s switch of allegiance played a key role) and in the rise to power of Corazon Aquino, a democratic reformer. Aquino served as President until she was democratically succeeded by Fidel Ramos. While she was an honest President, Aquino was unable to do away with the massive entrenched corruption, graft of Filipino politics and the poverty and underdevelopment it caused throughout the country. In 1998, popular former actor and Vice President Joseph Estrada was elected President, but massive corruption led to mass protests and his ousting in 2001, when Vice President Gloria Macapagal-Arroyo. Arroyo, who was controversially re-elected in 2004, has been attacked for corruption and her penchant for controversial constitutional reforms. Arroyo’s popularity has been negative since 2007 or so. Aquino faces major challenges, the same which his mother faced. Corruption, cronyism and graft is an established aspect of the Filipino political life, and party lines reflect that reality. Efforts to prosecute Arroyo will run into a strong opposition bloc in the legislature. The country still needs major reforms in both political power structure and land structure, but despite his apparent good-will, Aquino will face opposition from the established interests. However, he may choose to take the way of almost all Filipino Presidents and align with the established interests and feed them money and influence. The Senate results reflect the continued dominance of parochial, oligarchic or personality politics in the Philippines. Bong Revilla, the first-placed candidate for the Senate, with 16 million or so votes, is a former actor. The runner up is Estrada’s son, Jinggoy Estrada. In seventh place, Ferdinand Marcos, Jr. wins a spot in the Senate. I don’t know the makeup of Senate by party, but in the Philippines, people matter far more than parties (most of which are either patronage machines or personal outfits for actors and the like) and these people usually align with wherever the money is (eg; the President) and whoever best protects their parish’s interests. Lakas Kampi CMD, which is Arroyo’s party and the traditionally dominant legislative party, maintains a large plurality in the House due to its machines’ dominance in generally rural areas throughout the country. Arroyo herself has assured that she would remain in the frontlines of power by seeking a House seat, her son’s old seat in Pampanga’s 2nd district. She won her seat with 84% of the vote, and her party is aiming to make her Speaker of the House. Imelda Marcos, who had already been in the House between 1995 and 1998, ran for her son’s seat in Illocos Norte (the family’s stronghold) and won 80% of the vote as a Nacionalista candidate.